Bathe in the hot springs of Edipsos in Evia at the sophisticated Thermai Sylla spa. Yes, I know what you’re going to say about New Year’s Resolutions: they often lead to disappointment. And I totally agree with you, which is why this year I’m not going to make any – instead I’m going to experience, experiment with and make the most of the many things that can make my life better without feeling I’m putting myself in any state of discomfort. 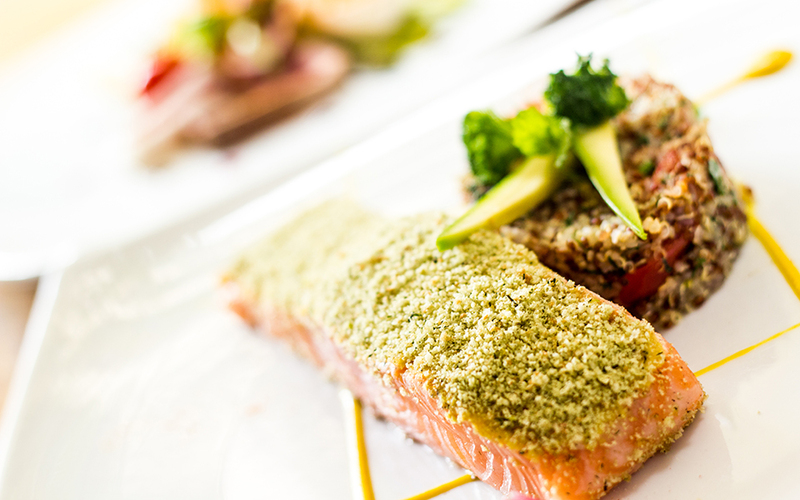 The raw-vegan-vegetarian dining scene in Athens just keep growing, increasing our appetite for healthy and delicious cuisine. First there was Avocado, which is still going strong, as well as farm-to-table Nice N’ Easy and raw-vegan Rosebud, all of which are great options for high-end Mediterranean and ethnic flavors expertly made with bio products. Newer arrivals include Wild In The City which opened a year ago and serves mainly raw foods; Lime Bistro, which centers on pure ingredients and high-nutrient foods; and fairy-vibe café/restaurant Melikrini, where you can enjoy comforting, super-nutritious soups, superfoods and hot drinks. In 2017, healthy eating won’t be something we do only when we eat out; it will be a daily habit to enjoy at home. Nutritionists keep telling us that what you stock your cupboards with is what you will end up eating, so it’s time to clear out all the Christmas sweets and other highly-processed, fatty, fried and preservative-packed junk once and for all, and replace them with organic, seasonal, nutrient-packed ingredients and products. If you want purely Greek food, there are now a plethora of options for fresh, organic, gourmet and quality traditional products to choose from, from pasta and berries to rare cheeses and fish. All the stores listed below (which you can shop at online or in person) and most organic mini-markets around the country provide tantalizing options for health-minded cooks. Let’s face it, sometimes you need the help of an expert to get your health in order. Maybe you have all the tools but don’t know how to use them, or perhaps you’re stuck with bad habits that throw you off course day after day. Those habits – be they major or minor – can be mental, emotional or physical, and can stop you from living your life to its fullest potential. An expert group of health professionals, made up of psychologists, psychotherapists and physiotherapists, offers face-to-face or long-distance personalized coaching sessions. And for your fizzling physique, there’s Kostas Mitsaris, who has trained some of Greece’s top athletes as well as mere mortals in private or group sessions, offering dynamic, direct and no-nonsense solutions that promise to transform your body into a lean, mean, high-performance machine. 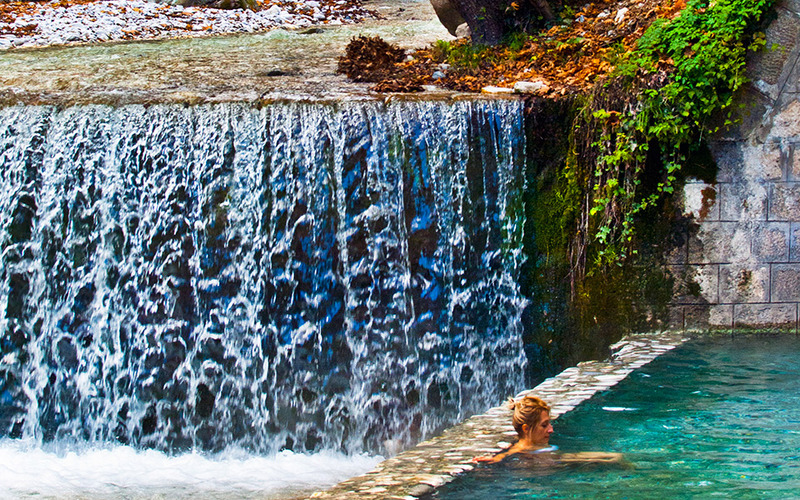 At Pozar Hot Springs in Pella (at the foot of Kaimaktsalan Mountain you can soak away all your aches and worries as you lie in 37°C water flowing from the Thermopotamos (which means “warm river”) and let the marvelous greenery around you soothe your senses. There are also facilities at Loutra Pozar (Pozar Hot Springs where you can enjoy luxurious massages, good quality dining and elegant accommodations. It’s an ideal solution, especially après-ski. Other fantastic options for soothing mineral spring therapy are Loutraki Thermal Spa in the Corinthian Gulf, famous since antiquity (as Thermae) for its healing springs, and the hot springs of Edipsos in Evia, where one can choose between the municipal public baths and the sophisticated Thermai Sylla spa. Learn to meditate like the stars – from the Beatles and Deepak Chopra to Ellen De Generis and David Lynch, transcendental meditation, aka the “easy way to meditate”, promises to bring all-round health. After meeting with your TM teacher a couple of times to learn how to practice, you can start dedicating 20 minutes every morning and night to repeating your mantra and enjoying the benefits of freeing your mind from even your most stubborn thoughts and all the hassle they’ve been causing. Some of the scientifically proven benefits of meditation include better blood pressure, sharper focus, greater oxygenation of the cells, increased sense of calm and control in life and enhanced creativity. We spend plenty of time and money on gadgets and clothes, foods, books and courses to improve our life but we often overlook the most obvious things – like how healthy our home or workplace is. Lydia Yiannoulopoulou, an architect/engineer specialized in Sustainable Bioclimatic Design, offers clients a detailed “check-up” of their space, using scientific equipment to analyze and assess things like radiation (from cables, WiFi, and antennae, as well as geological radiation) and geometries (how things are laid out architecturally and in the interior of the space). She also bases her study on an “Elements Chart” she creates for the space and for the individual living within it. She can help dramatically improve the energy of a space by proposing different building and decorative materials and items to overcome toxicity and establish harmony and wellbeing. As if we didn’t know it already, research has repeatedly proven the benefits of being kind, generous and grateful. Giving has been shown to raise happiness levels while boosting our connectivity with society, teaching us to develop a wider perspective of life as we discover who needs our help and how we can make a difference, and generating in us a sense of gratitude for what we have and what we can offer. There are innumerable organizations that need help in Greece – from refugee NGOs to animal sanctuaries and children’s institutions. Charity Vault lists an extensive variety of organizations in need of support around Greece as does Invest in Greece. With so many magnificent mountains in Greece, it would be a shame not to climb at least one of them in 2017. 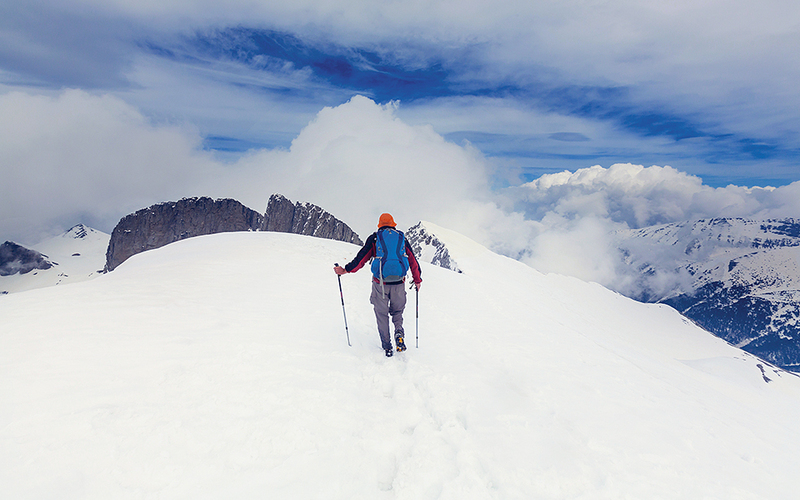 The most popular climbing ambition by far is the country’s tallest peak, on Mt Olympus, but other mountains with rave reviews from experienced or enthusiastic climbers include Dyrfis, Parnassos, Taygetos, Leuka Ori, Smolikas and Ghiona to name a few. Fortunately, you don’t need to attempt it alone, as there are now several experienced guides out there to take you from start to finish; they will also make sure to point out all the fascinating sights, stunning views and great accommodations and restaurants along the way. Even when the winter blues begin to have their wicked way with us, a brisk walk in the beautiful, colorful outdoors can work miracles in restoring our sense of self, our healthy flushed cheeks and a heart filled with renewed optimism. Fortunately, there is no end to Greece’s natural splendor, whether you’re in Athens or have chosen to drive off to some dreamy landscape further afield, or are combining the great outdoors with sumptuous feasting. The options for high-voltage radiance + stunning scenery in Greece are pretty much endless.